If your focus is on building wrist and forearm strength, then you need a hand exerciser than can offer a lot of resistance. 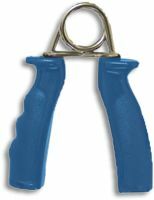 Fixed resistance grip exercisers do just that since the main resistance mechanism is a thick metal spring. With easy resistances as low as 3 lbs. of force, they go up to extra hard resistances of 48 lbs. of force. If you can do that, congratulations on having super strong wrists! With these, you can exercise by doing repetitions to build muscle or squeeze and hold to build up muscle endurance. Also check out the gyro exerciser called the Dynaflex Powerball. This exerciser contains a blananced gryo inside a ball. As you rotate your wrist, a counter spinning motion is created by the gyroscope generating resistance against your arm and wrist. As you spin faster, the force becomes greating making it more difficult to keep your arm stable. It s a great and fun exerciser that packs a big workout in a small device.